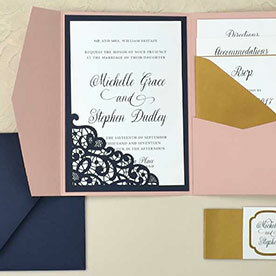 Photo features: Gold Leaf A7.5 Envelope, Antique Gold 5 1/4 x 7 1/4 Mat, and Gold A2 Envelope. Here at Cards and Pockets we offer everything you need to make your own wedding invitations. Please enjoy this free wedding invitation template. Use our designer editor below and enter your email address to receive your free template design. We can also print your design for you. We're known for having the best quality at the best prices. Just select the Professional Printing after approving your design. 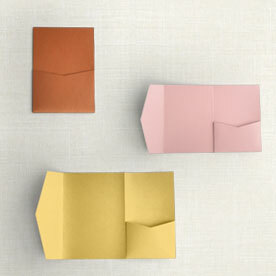 Click these links to see a list of papers and envelopes available in over 80 colors. Custom Invitations take 3-4 business days for processing. If you choose an ink color to match a Metallic paper color, your cards will be printed in the closest non-metallic shade. 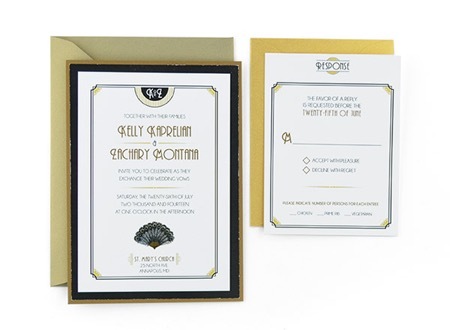 Custom Invitations are custom items and are non-returnable. Colors represented on the screen may not be true to print. We do name our ink colors to coordinate with our papers. We cannot guarantee the ink and paper will match exactly. "Watermark" will not appear on your final print. I understand these template files are personal use only and cannot not be sold.